Viro-cell® lawn is an alternative to runners. Using a Viro-Cell® lawn is a lot easier than runners. They cover alot quicker than runners and are low cost. 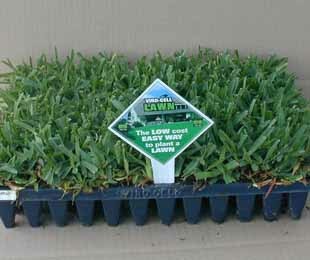 They are excellent for new lawns and patching up areas of lawn. Viro-Cell® usually come in trays of 49 or 108 individual pre-rooted plugs of lawn. To achieve a new lawn they can be planted at a rate of 5-10 per sqm depending on how quick you want coverage and the variety of lawn selected. NOTE: Empire™, Nara™, Palmetto® and Sapphire® turf varieties are not available in seed form, they do grow from runners though and are available in Viro-Cell lawn. 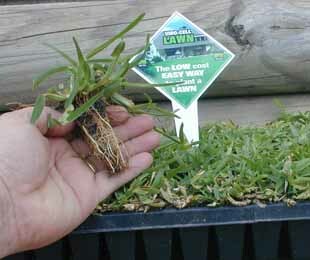 Click Here for more information on why Instant turf or Viro-Cell lawn is the way to go, and not seed. You can locate a Licensed Ozbreed Viro-Cell Lawn Grower by clicking on the state below. Supplies: Palmetto, Sapphire, Empire, Nara, Couch, Kikuyu, Dichondra, Microlaena and Bothriochloa macra.